Over the past several months, LGBT Life Center has been experiencing lots of positive and important growth as an organization. With a new look at its forefront and many exciting projects at hand for the community, there is much to be talked about. As advocates, the idea of sparking discussion within the community has always been an important part of this equation, and recently Hampton Roads has been buzzing. 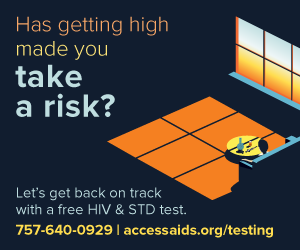 Last week, 13News Now published an article in response to an HIV/STD campaign that went up around town, specifically in the Downtown HRT terminal. 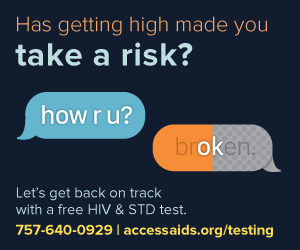 The campaign was designed to promote thought and discussion surrounding substance use and sexual activity by asking the question “Has getting high made you take a risk?” At its core, the campaign strives to drive discussion, spark thought, reshape stigma about sexual health and empower both users and nonusers to take initiative of their sexual health in order to stay on a safe path for a better future. LGBT Life Center was also featured in the Virginian Pilot and WAVY about our plans to open a preventative treatment clinic and pharmacy in Hampton Roads. The focus of the clinic, set to open in Hampton this December, will be on PrEP, an HIV prevention medication. When used daily, PrEP reduces the risk of infection by over 90%. The clinic will provide this medication to clients for free or at a reduced cost. Additionally, LGBT Life Center plans to open another clinic and pharmacy on the Southside to better service the entire Hampton Roads area. Subscribe to our mailing list to stay updated on LGBT Life Center events, projects, and happenings in the community.